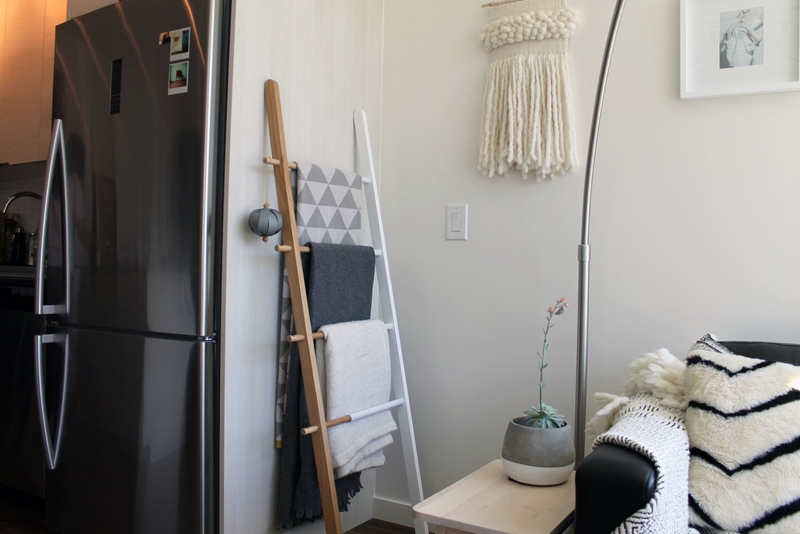 A millennial couple working in interior design and fashion come together to create their bright-and-airy dream home in a newly built 500-square-foot Victoria Park apartment. Zac Armstrong and Brittany Alamag at their Victoria Park apartment. Photo by Kait Kucy. 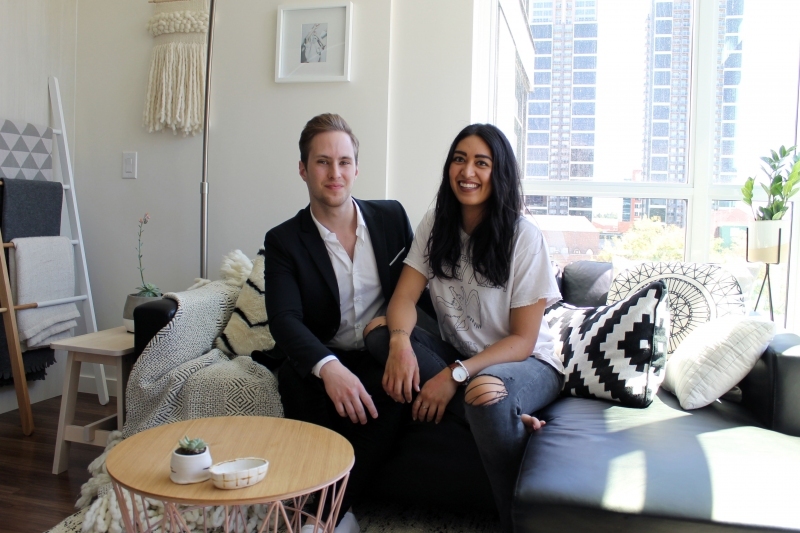 Brittany Alamag, an interior designer who also moonlights as a spin instructor, and Zac Armstrong, manager of The Kooples boutique in Holt Renfrew, have dreamed up their own little gem of a home in a newly built Victoria Park apartment. Having moved in earlier this spring, the couple has quickly put their personal stamp and defined sense of style on the place, melding their individual tastes into a delightfully cohesive space. Brittany Alamag: Design doesn’t need to be super high-end all of the time. I feel like it can be both high and low. It’s just about finding pieces that connect with you – that is how you create a space that people enjoy. Zac Armstrong: I think it is good to have a mix of high and low. I think we’ve got a few pieces that we invested in and others that weren’t much of an investment but they might be more meaningful. Simply put, things that are designed well, function well. ZA: You could argue that our entire space is one room. It is all one big living space and you can travel through every area. I do like our living room; it’s great to have the corner windows. BA: I am a huge supporter of the arts and I love collecting work from local artists. My favourite piece is also a recent one. My brother, Trevor Alamag, is a recent graduate from the Alberta College of Art & Design. We commissioned him to make the piece near the entryway. 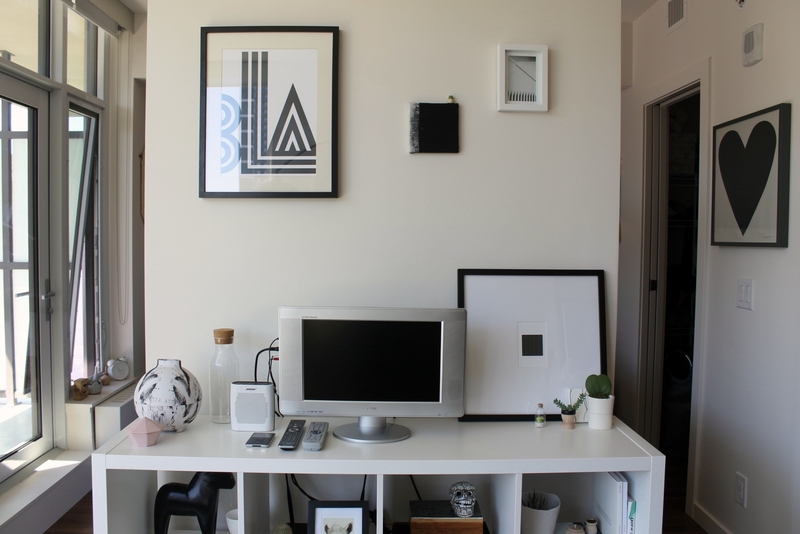 We both love fashion and our colour palette is mostly black and white, so I feel like it is a great graphic addition to our home. ZA: On a functional level, I love my professional chef knife. I love to cook; I use it for breakfast, lunch and dinner. 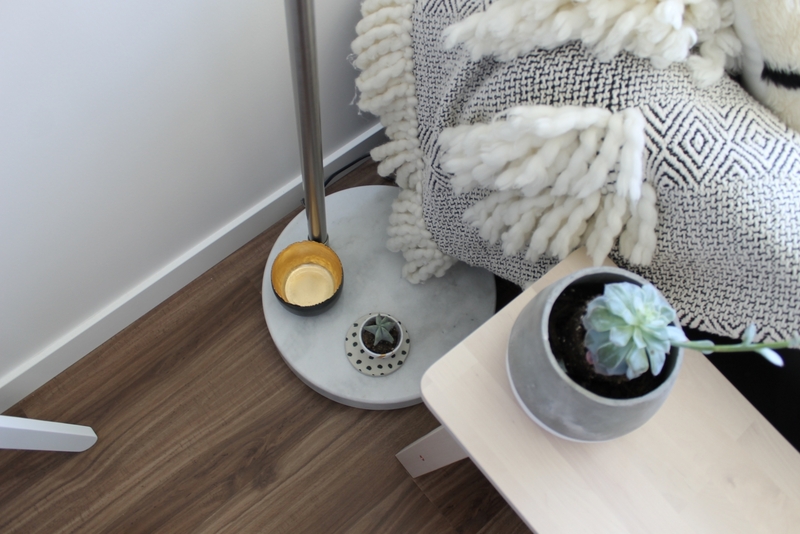 What is your favourite decor find in your home? BA: Our PlayType G print from The UnCommons. We walked into the shop and freaked out because it is so expensive to ship from Denmark. It was our first piece that we bought together for our new home. ZA: The G doesn’t really have any meaning but for some reason it is the most popular letter in the alphabet. People just love the G. We both have G in our last names! BA: Everywhere. I don’t really plan anything – I just come across things I love. ZA: Pinterest has been big for us. It’s a really great tool to visualize and gather ideas. We also love Instagram. I watch an unhealthy amount of movies so I’m sure I gather inspiration there as well. ZA: Yes, that has been a big thing for us. We also are really close to both of our works – we walk to work together. It is really important for us; our stress levels from not driving have gone way down. 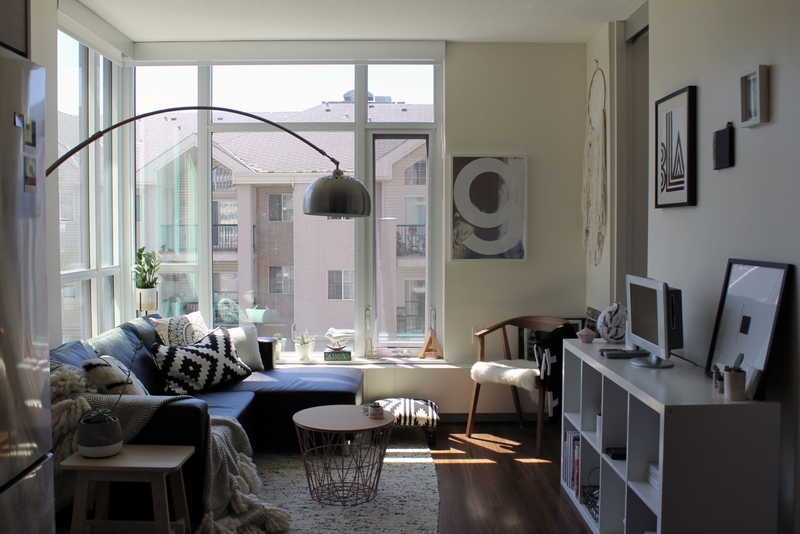 BA: The UnCommons, Greater Goods, Market Collective, IKEA and West Elm. We even find things at Homesense. ZA: Guildhall Home, Kit Interior Objects. 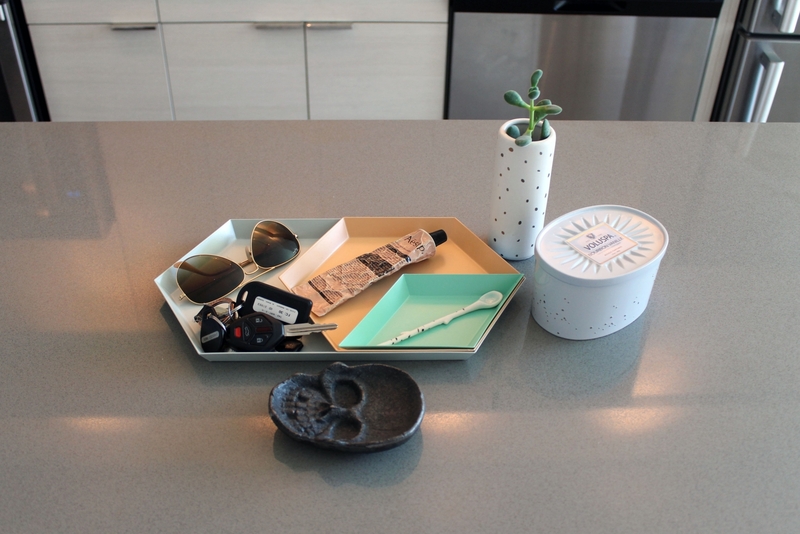 Did you encounter any design challenges when you moved in? ZA: Not really a design challenge, but we did spend a lot of time meticulously planning and hanging our art collection. It may look haphazard but it was all completely planned and measured. BA: We love our downtown lifestyle but I think one day I would love a house. ZA: I like the condo lifestyle. To me, the bigger the city the better. I love Calgary but I would also like any big city whether it is Vancouver or back to Toronto. For now I like the downtown lifestyle. Alamag and Armstrong have managed to pull a strong design aesthetic through the entire room at their 500-square-foot condo. Unique treasures collected by Alamag on her travels are found at every corner, even at floor level. One of their favourite additions to the space, the Umbra Hub ladder adds a sleek design element while also doing double duty as a storage solution. 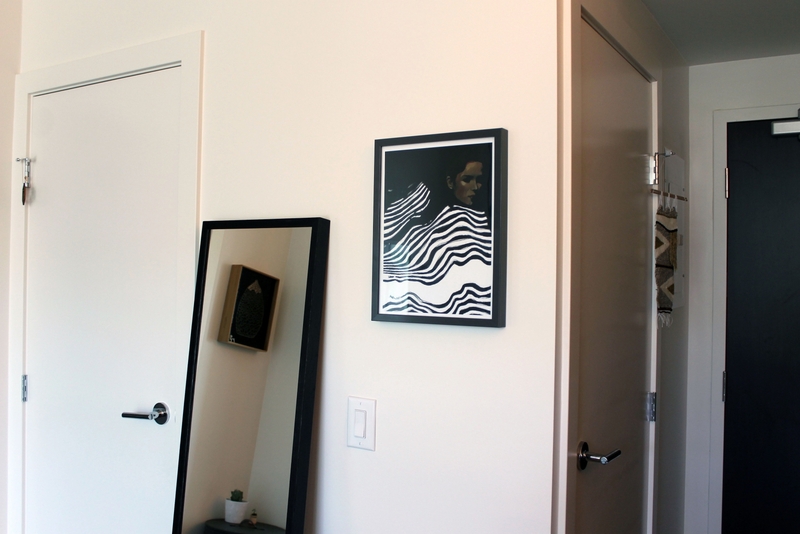 A black-and-white theme runs through the home, complete with a bold collection of framed artwork. 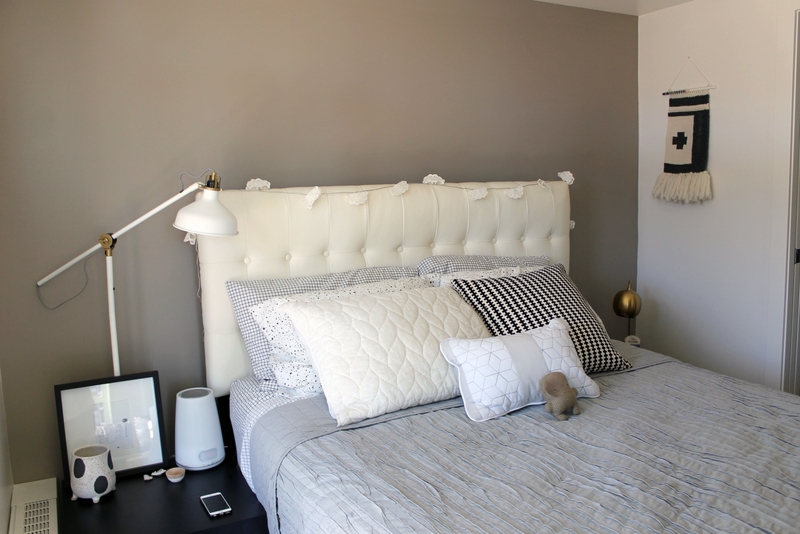 With the IKEA Kallax shelf acting as a credenza on the feature wall that separates the bedroom from the living room, the spaces are simultaneously separate and cohesive. The couple’s most treasured item is a commissioned piece of art by Alamag’s brother, Trevor Alamag, an artist who recently graduated from the Alberta College of Art + Design. 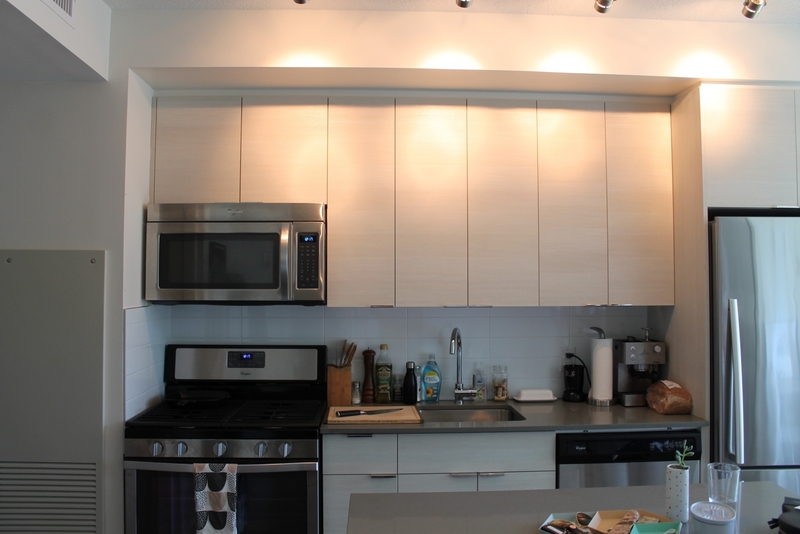 Compact and well-designed, the condo’s kitchen is classic galley style with muted greys and soft whites. The couple loves to cook together and this space becomes the perfect place to craft a delicious brunch for two. A casual spot to drop keys, mail and other day-to-day paraphernalia, the kitchen island allows the couple to have a place to eat and entertain despite not having a dining area. The bedroom may be small, but it is full of personality with original artwork, ceramics and textiles that make the room pop.